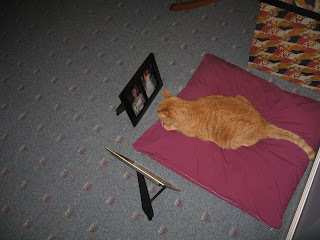 Apparently my parents think that Honey misses being at Erin and Matt's house, so they put some photos of Erin and Matt in front of Honey's "bed". I purchased myself a lamp for my desk at work. I've been wanting one for a while (I bought a cheap one a while back but don't really like it). I can't wait to set it up. 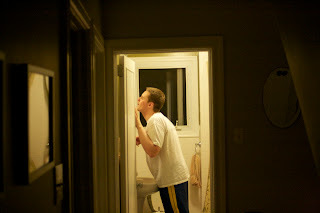 April 28, 2009: What is Chad Doing? What is Chad doing with that mirror? Looks like maybe he's practicing kissing? Haha. I think he's checking his teeth because he just brushed them or something. 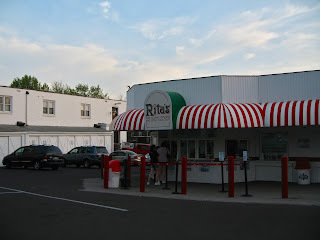 April 27, 2009: Rita's Water Ice! 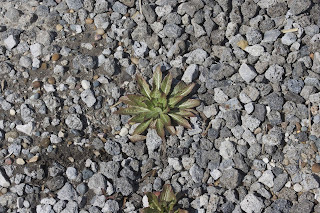 Although it is quite dirty to have trees and plants shedding their old plant material all over the yard, sometimes it is neat. 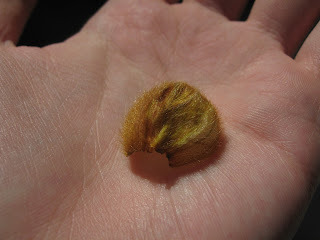 I like how this furry thing looks. Chad and I took a walk around our neighborhood today. 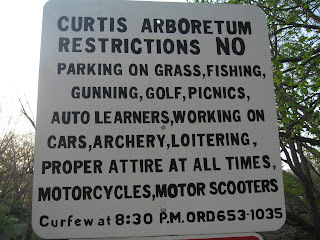 We ended up at Curtis Arboretum. Look at the rules. Do they realize they have banned "proper attire"??? Today a group of people from the meeting took a walk to do some bird watching. I decided to join them since it was so nice out. 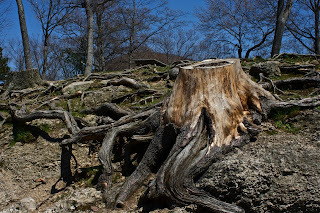 I saw this awesome tree trunk and roots. 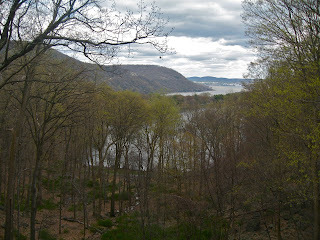 I got back from Michigan late last night and today I drove up to Bear Mountain, NY for a meeting of the Hudson Delaware Chapter of SETAC. It was a beautiful setting. Steve and I flew to Michigan today for a new project and we had to fly through Detroit. 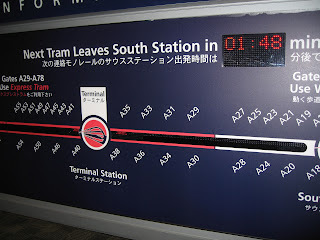 In that airport, they have a tram with this information board. It's all in Japanese too! 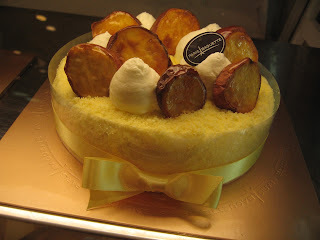 Here is a photo of the Sweet Potato Cake at the bakery at H Mart (Paris Baguette Cafe). I love Korean (and Japanese) bakeries. So many wonderous things to eat. I went to my parents' house today to mow the lawn for them. 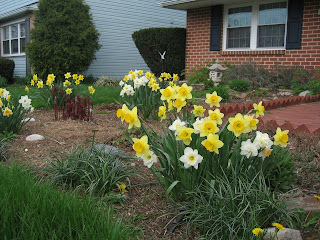 Look at all my mom's wonderful daffodils. Too bad she was in Japan and missed seeing them. 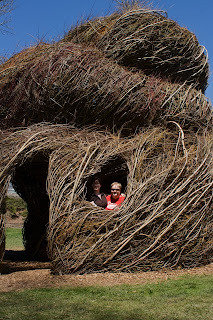 Adina, Steph, Chad and I headed over to the Morris Arboretum today to check out the Patrick Dougherty statue, which was made of branches. It was sweet!! I guess I forgot to take a photo today too. Adina and Steph arrived, so I was overcome with joy, I guess. 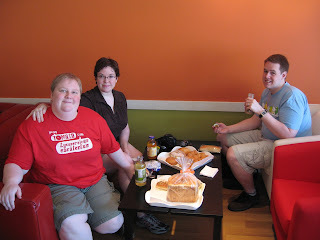 Here's a photo from the next morning at the Korean bakery! 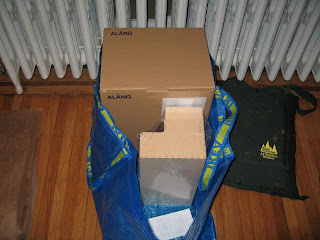 Oops, I forgot to take a photo today (I don't remember forgetting, but I don't have a picture from that day, so ...). 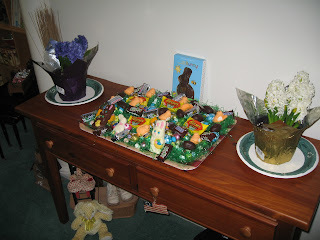 Here's a picture from Easter. Aunt Beth put out candy!! Today the sun was shining brightly and it was reflecting off cars in the parking lot, and making shadows on my wall. 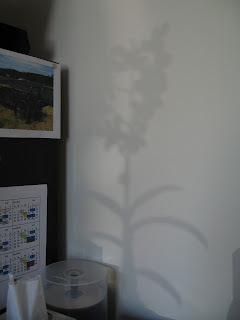 Here's a shadow of my orchid! 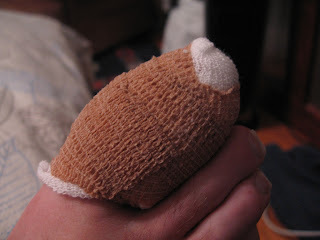 I apologize for those faint-of-heart, but I just had to post this photo of my toe. I took the bandage off to clean it today and look how gross it was! I went to the podiatrist today and she decided to cut my toenail for me. Why is it bandaged? Because she had to go under the skin to do it! Stupid ingrown toenail. Sorry for the somewhat poor quality of this photo, but it's just perfect. 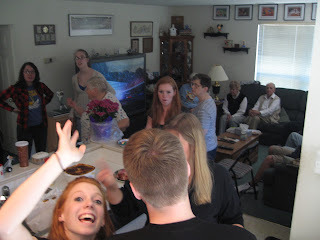 This is Chad's family on Easter at Aunt Beth's house. The lovely one in the corner is Veronica. 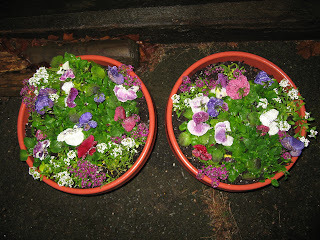 Chad and I decided to buy some pansies and alyssum to put in pots on our front porch. We should do this more often. Look how nice they look! 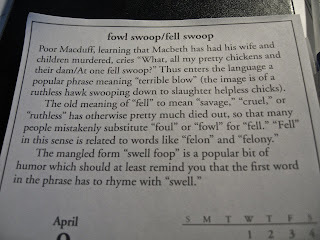 I got Heather this daily calendar of "common" grammar mistakes. They've been (unexpectedly) hilarious. Check this one out (click to enlarge). How says these things? Check out the last sentence especially (sorry it's blurry). 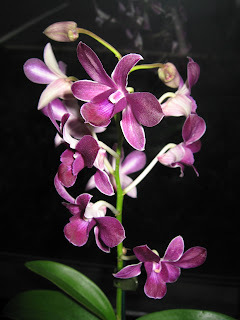 Trader Joe's was selling cheap orchids, so Chad and I each got one for our offices. It's been interesting watching the progression of work next door. 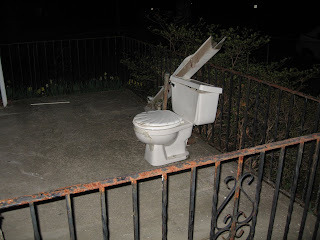 Today we discovered they were working on the bathroom - the toilet was left out on the porch. 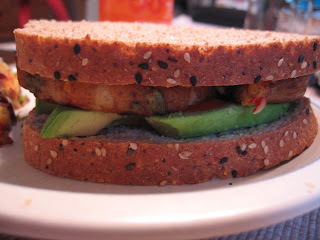 I made myself a Masala Burger sandwich today with avocados. It's on one of my favorite breads - the healthy multi grain. It was so tasty. I replaced the hard drive in my MacBook today with a 500GB drive (replaces the 80GB one). 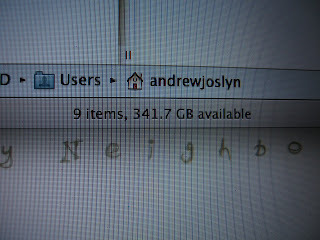 I'd been at capacity for a while - my Japan pics put me over the edge. 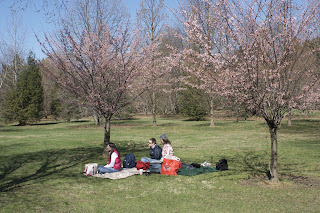 Today, Heather, Erin, Chad and I went to the annual Cherry Blossom festival. It was windy, but the sun was warm. We found the only two (partially) blooming trees. I decided to make some salads for tomorrow's O-Hanami party at the Sakura Festival in Fairmount Park. 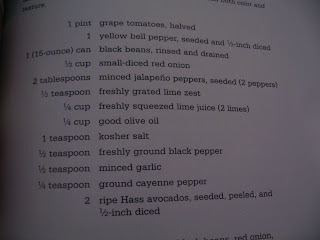 Here are the ingredients for one of the tasty salads. 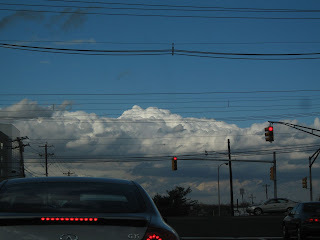 The clouds looked awesome today on my way home. Notice I'm stopped at a red light, so totally safe to take a photo! Here is a photo of most of my loot from Japan. 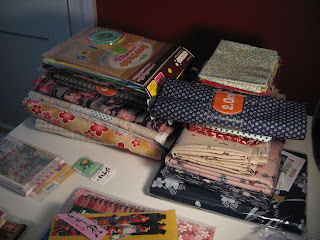 I mostly bought fabric. There were so many cute ones, I couldn't resist! I got a new iPhone today because I had a problem with my SIM card. It's a long story. I got it home and restored it right away. 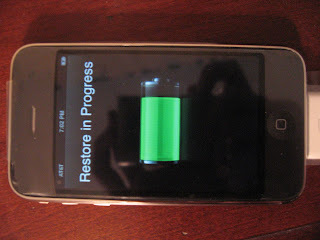 It didn't restore everything though. Lame.